Prime Wedding Dates Now Available! The Shandon Hotel & Spa has had a busy winter creating a brand new restaurant, leading off their new cocktail bar on level 2 of the property. The Restaurant will be launched early 2018 which has resulted in key dates being freed up in the Shandon Ballroom. Prior to the launch of the new restaurant the hotel would only do one wedding per weekend and they would never allow a wedding on a Saturday because the demand was so high for their restaurant and the original restaurant was where the weddings would be hosted. The resort is also introducing an additional 18 bedrooms early spring which brings the total amount of rooms to 68 with the majority having an unrivalled view over Sheephaven Bay. Carolynne Harrison, Resort General Manager said she is delighted to be able to accommodate more weddings with the introduction of their new restaurant and a dedicated ballroom, all of which boast a spectacular view over the bay. ‘It broke my heart’ she says to turn away dozens of weddings every year because we had vowed not to have a wedding on a Saturday or in the summer because it would mean we had no restaurant facility for our leisure guests. We identified that we had super demand from the leisure, spa and wedding markets, so in order to meet this demand and to ensure that each market had a fabulous experience, we knew that we had to create a cocktail bar and new restaurant on the second level, which allows our wedding guests exclusivity on the ground level incorporating the hotel lobby and our leisure and spa guests can enjoy their own space on level two, which each group not knowing the others where even in the building! Carolynne stated that wedding bookings for 2018 are already up 68% on last year, however, she still has some key dates available in 2018 and 2019 but they are getting snapped up super quick! Saturdays in the summer and some coveted dates between Christmas and New Year are how open, where previously, they wouldn’t have been available. The Shandon Wedding package offer bespoke (Sparkling, Prosecco & Champagne) packages ranging from just 55euro per person, even the most basic package has everything you will need at the venue level, décor comprising chair covers & table centres, drinks reception, 3 course meal with a choice on main and dessert, wine with the meal and an evening buffet. 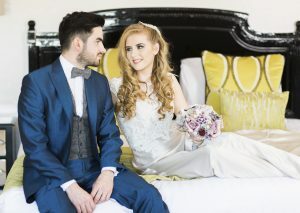 Once a bride & groom book with the Shandon they will be invited for a consultation with Ultimate touches to choose their décor from a wide range of the latest trends. Food at the Shandon is not a ‘typical’ Donegal function meal. The bride & groom design their own menu following an extensive tasting with the Executive Chef and will have full creative control over how each dish is presented & tastes. Everything is made fresh in house so anything is possible. The review on the food at Shandon events has been unprecedented because the team have promised that the standard of food & presentation will be consistent with their fine dining restaurant. Carolynne also highlighted that discount is available for bridal parties in their luxury spa pre or post the wedding celebrations, she indicated that many of her bride & grooms have extended their wedding party with the following afternoon spent in the spa followed by a barbeque on the terrace overlooking the bay. Wintertide Hideaway at the Shandon!